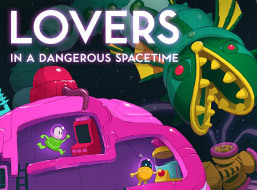 Lovers in a Dangerous Spacetime started off at the Toronto Global Game Jam early in 2012. Being veteran jammers, we were invited by Troy Morrissey, who organized the GGJ Toronto space, to take part in the jam and get interviewed for the documentary he and his crew were filming, Game Jam the Documentary. We had a great experience that was filled with ups and downs and a lot of silent typing. The game was playable, but had some bugs. At the time we were worried of showing too much because it was still rough and we knew there was a lot we could improve upon both visually as well as gameplay-wise. So as jam games often go, we took a break from it and planned what we should do next.